With iPhones and iPads snapping 8-megapixel images and HD video like it’s going out of style, storage can quickly become an issue—especially as Apple has kept the entry-level models at 16GB even while increasing storage for the higher-end versions. This can be an especially sticky problem while traveling, and not just because you take more photos and video clips. Maybe you can’t upload your images to cloud storage without a data connection, maybe you’re about to run up against your data plan’s ceiling, maybe hotel Wi-Fi costs too much and performs terribly, and maybe you didn’t bring your laptop to offload images to its hard drive. 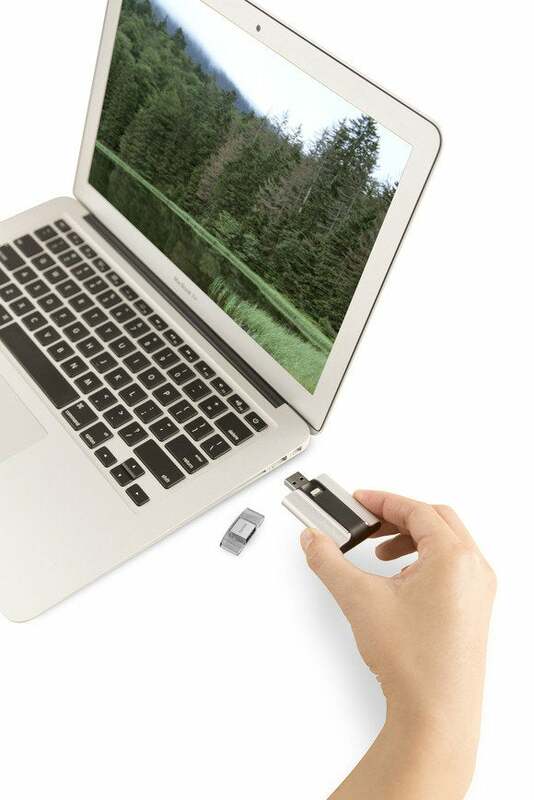 SanDisk’s iXpand Flash Drive has you covered. iXpand is compact and portable, but I'm telling you now I'm destined to lose the cap for the USB connector. 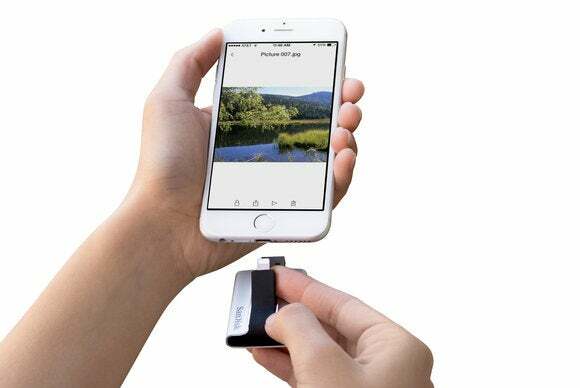 iXpand is a small, portable flash drive with both USB and Lightning connectors. Its companion iOS app lets you back up videos and photos from your Photos app, so you can delete them and free up space to shoot more. It comes with 16GB of storage for $60, 32GB for $80, and 64GB for $120. You can also load up iXpand with files from your computer and make them accessible on your phone. It’s particularly great for toting along an extra movie or two while you’re traveling, since you don’t have to worry about converting the video to the right file format or size for your device. The drive works with Macs, PCs, and any iOS device with a Lightning port, as long as it's running iOS 7 or later. The Lightning connector pulls out from the iXpand’s body on the end of a flexible rubbery arm, and the connector itself is thin enough that I was able to use it with my iPhone 6 or iPad in a case. I hate having to remove a device’s case to use an accessory, so that’s a big point for iXpand. A tiny little light on the side blinks to warn you if it’s transferring a file, so you don’t yank it out of your computer while it’s working. The same light glows red when iXpand needs charging. It charges when connected to your computer’s USB port, and you’ll wind up doing that anyway, so in my time with iXpand so far I haven’t actually seen that red light go on. You can set up your own folder structure on the iXpand, just like any flash drive. iXpand Sync shows the contents of your drive, and a big + button lets you access the photos and videos stored on your device, so you can transfer them to the flash drive. 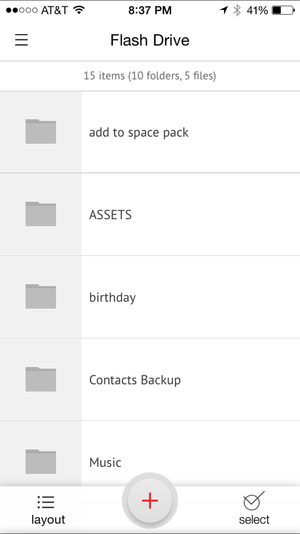 You’re able to create whatever kind of folder structure you want for your iXpand. If you don't want to add your photos manually, the Camera Sync option in the sidebar will let you set up an automatic sync of your Camera Roll whenever you connect the drive. 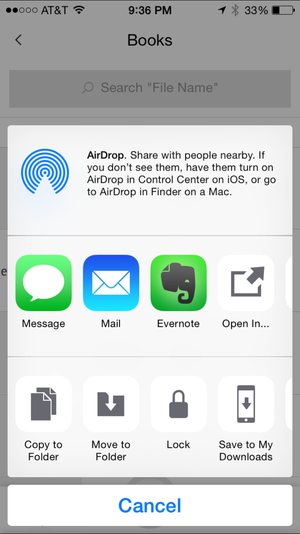 You can tap on any file in iXpand Sync's lists to view it, or swipe it to the left and tap a button that looks like three vertical dots for more options, including opening it with another app, sharing over AirDrop, moving it to another folder on your iXpand, or locking it with a password and 128-bit encryption. Those extra options could be a little easier to find—I’d love to see the same three-dots button added to the screen where you view the file too. They’re present when you’re looking at image files, but not on other filetypes, like PDFs and spreadsheets. iXpand Sync lets you view files, move them around on the drive, save them to your phone, or open them in another app. The app lets you delete files stored on your drive, but not files stored on the phone itself. Once you’ve copied photos from your Camera Roll to the iXpand, you still have to pop over to the Photos app to delete them there in order to free up space on your iPhone or iPad. That’s for the best, though—I don’t know of any third-party apps that let you delete photos from your iPhone, and if iXpand Sync could do it, it would be easy to get confused as to whether you’re deleting apps from the drive or from your actual iPhone. It's nice to be able to see how much space is left not just on the iXpand drive, but on your phone itself. And the automatic Camera Sync feature is a no-brainer for anyone who would prefer their photos not be synced by cloud. One of my favorite features is being able to load up the iXpand with movies from my Mac’s hard drive, without having to convert them to formats that the iPhone and iPad can play natively. Supported formats include WMV, AVI, MKV, MP4, and MOV. Then when you connect the iXpand to your iPad or iPhone, you can watch the videos inside the iXpand Sync app, which transcodes them behind the scenes. You can even transfer files from the iXpand drive to your phone. 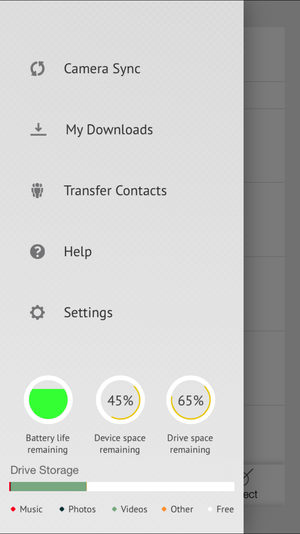 They stay within the My Downloads folder in the iXpand Sync app, but from there you can open and edit them in other apps, share them, send them to cloud storage, whatever. While the iXpand excels as a way to add to your device’s built-in storage, it’s also nice to be able to pull a file off the iXpand so you can work with it on your device without having to keep the iXpand tethered to your Lightning port. A sidebar in the iXpand Sync app provides at-a-glance info about the drive’s remaining battery life, as well as how much space you have left on the iXpand drive and on your device itself. There’s even a shortcut to back up all your phone’s contacts to the drive, and restore them later. The app could use some small refinements, like enabling the swipe-to-go-back gesture so I don’t have to stretch for the back button in the upper-left corner. But what’s here works well, and I’m impressed with the iXpand’s build quality. If you have a Lightning-equipped iOS device that could use more storage, it’s worth a look. iXpand comes with plenty of options to back up your iPhone's photos, and keep your most important files with you at all times.